Mighty real. | Pulp and Circumstance, Juiced. If you are facing a serious need to help pummel you through the second half of the last work day of the week, might I introduce you to the brilliance that is Sylvester James. Know little of James? He is a 70s disco and soul singer, most known for his brilliant drag shows. Move aside Gloria Gaynor, the true “Queen of Disco”, stage name Sylvester, will really help pep you on the dreary day, especially with one of his most famous tunes “You Make Me Feel (Mighty Real)”. 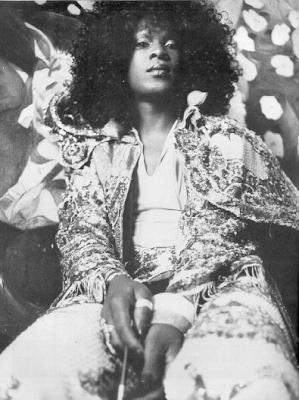 James, an iconic gay disco performer, got his start as a child, singing gospels at the Palm Lane Church of God in Christ in South L.A.; as an adult, he’d move to San Francisco and star in Women of the Blues–with a hefty repertoire of standards, from Bessie Smith to Billie Holiday–before scoring a music contract and moved toward pop, soul, funk, and of course, disco. This entry was posted in jwolf and tagged disco, sylvester james. Bookmark the permalink. ← Dog days, they’re over.